Saving energy by 40% using LED backlight is something that anyone would want. But if you can enjoy additional savings of 25% with image loss, that will be really marvelous. LG E41 Series opens the era of "SUPER Energy Saving" with technology power unique to LG Beyond the "Energy Saving" realized with LED. The LED backlight that reproduces images in brighter, clearer colors plus the excellent expression of contrast of the Mega Contrast Ratio that adjusts even the micro changes in color tone let you enjoy video and image contents more clearly and vividly. Enhances energy efficiency but suppresses the generation of harmful substance! E41 Series, which uses Eco-friendly LED backlight, is a global green monitor certified “EPA”(US Energy Efficiency Standard) and “EPEAT” Gold (US Energy Environment Mark). As a power built-in type that has eliminated the superfluities from the back side, it boasts of smartness with stable edge square base and amazing slimness. LG’s Super Energy Saving Technology reduces luminance to save energy. Increases data gain, and opens the LCD aperture further to maintain image brightness. The noise that can be generated during this process is removed by f-Engine (RCM&ACE). As a result, images are reproduced without any image loss while saving on overall power consumption. Compatible with Windows 7: "Compatible with Windows 7" software and devices carry Microsofts assurance that these products have passed tests for compatibility and reliability with 32-bit and 64-bit Windows 7. 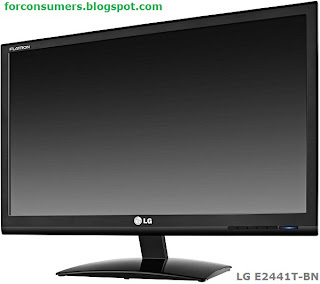 LG E2441T-BN is a nice monitor and probably the best choice in this price range.